This chapter introduces adoption theory and applies it to examine the use of wireless fidelity (Wi-Fi), which has the potential to expand virtual workplaces significantly. Research shows that the use of Wi-Fi to access the Internet is surprisingly low. As understanding users and their needs is a prerequisite for the success of any new information technology, this chapter identifies factors accounting for the low usage of Wi-Fi in organizations and seeks to build a model to increase Wi-Fi usage. Empirical research reported in this chapter shows that motivations of Wi-Fi use, mass media use, and technology cluster have impacted on the awareness of, interest in, and likelihood to use Wi-Fi. More important, a chain-effect process in the adoption of Wi-Fi was presented: the awareness of Wi-Fi, which was influenced mostly by reading newspapers, had a direct effect on interest in Wi-Fi, which directly affected the likelihood to use Wi-Fi. Thus, to increase Wi-Fi usage, the awareness of and interest in this newer Internet technology must be in place. 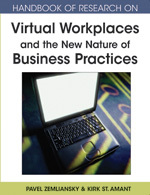 The chapter also discusses future trends in Wi-Fi technology and how increased adoption of Wi-Fi enhances the virtual workplace. Wi-Fi: Short for wireless fidelity, it is a general term for wireless 802.11 Ethernet standard via radio waves rather than wires in the 2.4 GHz frequency range. It is also known as IEEE 802.11b and 802.11g with a data transfer speed up to 11 Mb/s. Mobile Computing: A term referring to portable devices run on microprocessors with the capability of accessing computer networks wirelessly. Wireless Networking: A technology of 802.11b and g that creates a wireless network. A client computer equipped with network interface card can access a LAN with an access point. Adoption: This term refers to decision-making about how to best use a technological innovation. Based on the time of adoption of an innovation, adopters are classified as innovators, early adopters, early majority, and laggards. WiMAX: A term for the newer Wi-Fi technology using the IEEE 802.16 wireless Ethernet standard. Its transmission speed is up to 120 Mb/s in the 10-66 Ghz range. Wireless Internet: A network that allows users access to a computer network using a wireless connection within the reach of a hot spot. Diffusion of Innovations: A social psychological theory that describes and explains the patterns, mechanisms and process by which a new idea, product, or technology is communicated through various channels in society. Radio Networking: Another term for Wi-Fi because it provides seamless connection with a local area network (LAN) via radio waves instead of wires. WLAN: A wireless local area network that connects computers and servers to share application programs and files.